Hosting an event needs lot of preparation and sweating to make it a success. However, many a times, despite of the best of your effort, the event doesn’t produce the effect it is meant to. To make sure that it doesn’t happen for the next time; get the sophisticated Lace Table Runners, which incorporates the ancient art of lace-making to elevate the style quotient. The table runners integrate flowery design with diverse flower patterns, including full-petal flowers and side petal flowers. The beautifully crafted floral pattern not only introduces fresh lease of life to the table ensemble, but also infuses liveliness into the whole event. The graceful and laid-back design of the table fabric ensures you and your guests have a relaxing and fun filled event. 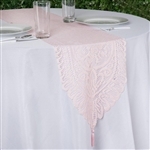 You have an option to choose the table runner in either of the white or ivory color.